In the process of overhauling my sewing room, I started yet another unplanned project that just randomly inspired me. A very dear friend of mine, my mother by heart, gave me this beautiful sewing chair as a wedding present. 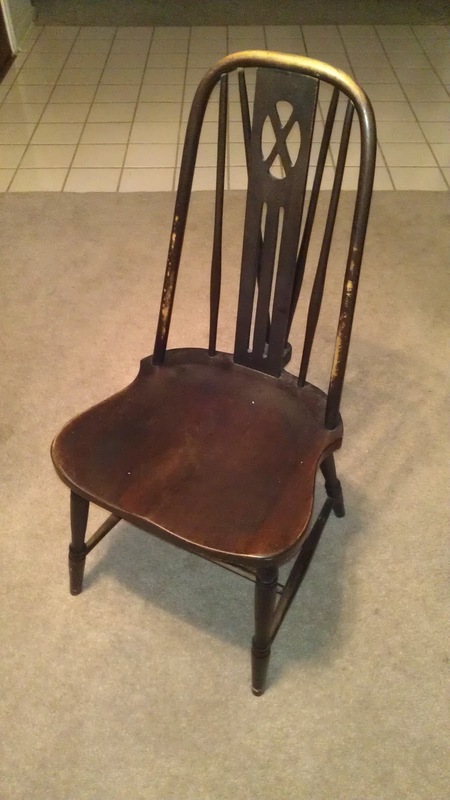 This chair belonged to my friend's grandmother, and was a family heirloom. My friend often told me that I reminded her of her grandmother with all of my sewing and creating. When I would tell her about a new project I was thinking of, or show her something I had just made, she would say that I "had an eye for things" just like her grandmother, and that the way I could look at something and then create my own version was another quality we shared. I know my friend had a very special relationship with her grandmother, so I felt blessed and honored when she decided to pass the sewing chair on to me. 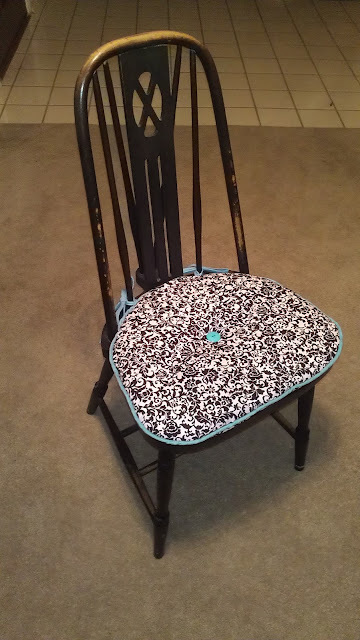 I knew in my sewing room overhaul that this chair would definitely have a prominent place in my new room. As I finished this wall hanging, I suddenly knew what to do with the extra fabric from the project. 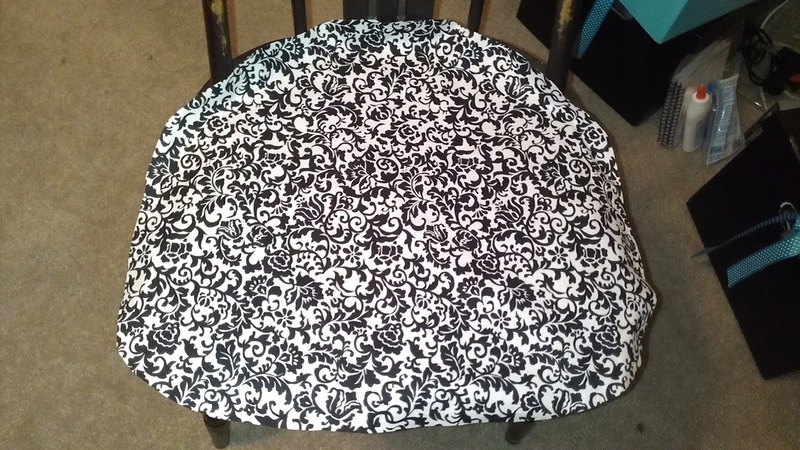 I decided to make a cushion for this chair. To be honest, I had no clue what I was doing. I have never made anything like this before, and I didn't have any pattern except for the picture in my head. I told myself that if the project didn't work, it was no big deal, because I was just using fabric I already had, so I wouldn't be out any money. 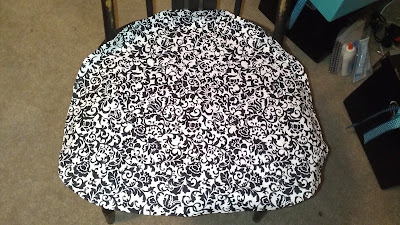 I started by laying the fabric out on the chair and cutting a rough outline, leaving myself plenty of room for error. Then I marked what would be the center of the cushion and cut half of it out carefully, following the general outline of the chair seat and leaving myself about an inch extra on the sides. Next, I folded the fabric down the center line and cut the other half to match. It seemed to look pretty good, as far as I could tell, so I cut out the second piece just like it. I love the damask fabric, and how it will tie in with the wall hanging, but I thought it needed something more. I decided a pop of the blue color I'm using in the room would set it off nicely. I took scraps of blue fabric, also left from the wall hanging, and made my own cording to go around the edge of the cushion, as well as some seam binding to use as ties. 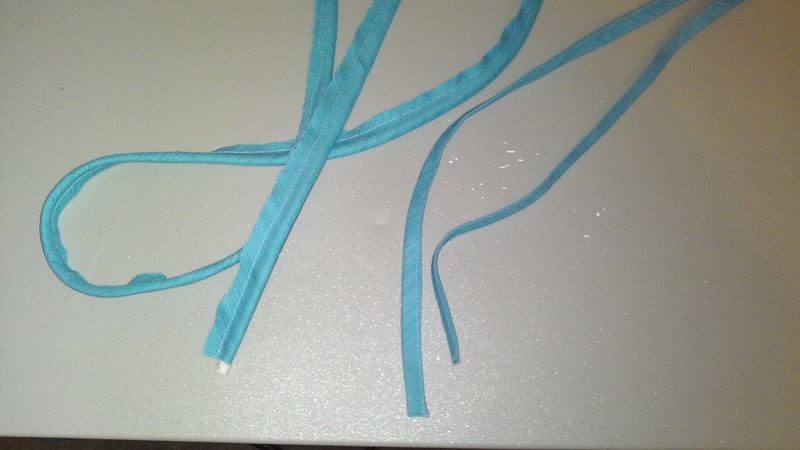 That's the cording on the left and the binding on the right. Basically, all I did was cut strips of fabric on the bias that were about 1 1/2 to 2 inches wide. I don't even know the exact measurement, because I just grabbed a scrap of wood from the garage that looked like the right width to me and used it as my guide. The width isn't that critical, though, especially for cording. The important thing is that it is cut on the bias, because that gives the cording or binding the flexibility it needs to go around curves. For the cording, all you do is fold the strip in half and run the cord inside along the folded edge, basting the raw edges together. The binding just requires an iron. I wanted double-fold binding, so I folded the whole strip in half and pressed it, and then opened it up and folded both of the raw edges to the press line and pressed it again. At this point you have a flat piece with the two edges folded in to meet in the middle. Then, keeping the raw edges inside, you simply fold on your first press line--the one that does down the center of the whole thing, and touch up the pressing a bit. I then stitched the edges closed so I basically had a tube of fabric. For this project you could just put the right sides together, seam it, and turn it to get a long skinny tube. I just hate turning long skinny tubes, so I chose this method. I basted the cording around the edge of one of the pieces of fabric. Then I laid the fabric on the chair and figured out where I needed to place my seam binding ties so that they would line up with one of the chair rungs. I also basted these in place. Next, I took the other side of the cushion and pinned it to the first piece, then stitched around it, leaving a small opening to turn. The trickiest part of this is sewing close enough to the cording; I just feel with my fingers where the cording is and go a little slower than usual. If I had decided to stuff the cushion with polyfil or something similar, I would have turned it at this point. However, I didn't have polyfil, but I had tons of quilt batting on hand, so I wanted to use that. I pinned four layers of quilt batting to the cushion and stitched around it. I didn't cut the batting to the shape when I pinned it, I just pinned a large square. Dealing with trying to keep all those edges together just didn't sound fun. After I stitched it, I trimmed the batting close to the seam line, turned the whole thing inside out, and slipstitched the opening closed. To finish it off, I sewed a blue button in the center, on both sides of the cushion. I sewed them together tightly, so that the cushion would "bubble" up around it a little bit and give it that cushion-y look. Somehow, even though I didn't really know what I was doing, it worked out and fits my special chair perfectly. :) It looks beautiful in my new room.